NEW - I can offer FRF / SGO 2 BIN Conversion and BIN 2 SGO / FRF for almost ALL VAG DSG Gearboxes !! PRICES Between 50 and 100 eur. This corner is dedicated to the VAG DSG Gearbox and the DQ250 Mechatronic unit . It seems that most affected cars are the VW Passat , VW Touran and the VW Golf produced between 2003 and 2007. I have only seen a few Skoda and a few Seat. If you consider my information useful please click some of my adds to keep this site up and runing. Japan by automatic gearboxes. Both types of gearboxes have specific advantages and disadvantages. • robust and sporty characteristic. • a high level of comfort, above all in gear changes, as there is no interruption in tractive power. new gearbox generation: the direct shift gearbox. well capable of meeting the high demands in comfort from drivers who favour automatic gearboxes. driving enjoyment to drivers who favour manual gearboxes. In both cases, fuel consumption is at a par with economical vehicles fitted with manual gearboxes. is a faulty TCM module. This is mostly seen when the gearbox oil temperature goes above 40 degrees Celsius and we will start seeing error codes as "18222 P1814 Pressure Control Valve 1 (N215), Open / Short to Ground" or some other Short to Ground errors on the other valves. Most of the valves can be refurbished but until now I have never seen anyone being able to refurbish the Pressure Control N215 or Pressure Control N216. Flashing PRNDS in the Dash and the gearbox will switch to neutral. If this does not help or only for SHORT term, your next move is to change the N215 / N216 solenoids. Again, this can be caused by sticky N215 / N216 , changing them should help. * This problems can be caused by worn valves. Changing the affected valve might solve your problem (N215 / N216). If you have any other experiences please let me know, I will add them. For whoever needs I can supply electronic parts for the DQ250 DSG Mechatronic / Mechatronik units. 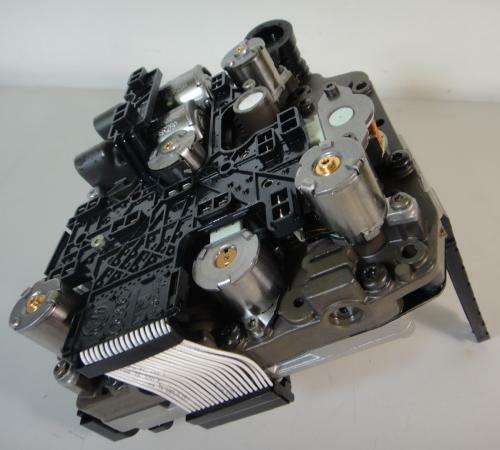 Circuit boards, solenoids and also some whole Mechatronic units are available also upon request. Mechatronic Pressure Control Valves are available on request. ** This errors can be caused by insufficient oil in the gearbox. Please check the level and the quality of oil first. If you need some of this or you have any problems with your DSG Gearbox of the Mechatronic unit please drop me an e-mail at jaxelos @ gmail.com and I would be more than happy to help if I can. I can fix /repair Mechatronic units including the circuit boards if necessary. Let me know what the problem is with the unit and I can give you a quote. !!! I live in DENMARK !!! ALL YOUR ABS Sensors are working in perfect condition. You can log the signal of all 4 sensors with the VCDS Tester. or VCP. The most important one here is the REAR wheel sensors. Make sure your diesel filter is changed and not filled up with oil. You changed the DSG oil and filter and you performed the DSG Adaptation correctly. You have no other errors on the engine control management. Your EGR Valve is in good working condition and engine runs as it should. CHECK your VACUUM Pump and be sure there are NO OIL LEAKS that will reduce the Vacuum necessary for the perfect working condition of the engine. In order to get a better overview of your problem please try to DESCRIBE the problem as good as possible but do no write me a whole novella. tell me from where you are! "I have a problem with my DSG, please help me"
"Do you have a file for DSG6 6?" or similar e-mail. I will try to help the people who really need the help but please do not waste my time. If you have a LOG file with the errors of the car please SEND the log file along with the e-mail. Send me some details about the car also : Make, model, year, engine code, gearbox code,VIN number and please try to get the error codes... as many details about the problem as possible. DO NOT HAVE TIME TO ANSWER EVERYBODY ANYMORE , SORRY !! WITH MANY PEOPLE I USE DAYS TO TRY AND DIAGNOSE A PROBLEM AND AT THE END I DO NOT EVEN RECEIVE A "THANKS". IF YOU THINK MY TIME IS WORTH SOMETHING AND YOU REALLY NEED MY HELP PLEASE MAKE A SMALL DONATION TROUGH PAYPAL. - Do not overheat the car and do not push it to its limits when HOT. - Keep the engine in good working condition (smallest problems can influence how the gearbox changes and reacts). - Once in a while check the rear wheel bearings on the rear wheels (they have the ABS rings built in) and if you feel they are noisy change them. - Do not drive with the car in water that can go above your DSG connector on the gearbox. - Keep the engine room clean and once in a while (every 2-3 years) clean all the earth connections in the engine bay. - Check the condition of the DMF and if it's noisy or it has play, change it before it damages the clutches, drive shafts. - Check Cooling fluid level regularly and if it drops below level and you can not see where the water goes, check gearbox oil for contamination. DSG oil coolers tend to break and oil contamination will occur. Here is a detailed video on how to change the Valves / Solenoids on your mechatronic unit. Here below is one of my old videos while I dismantled and put back together the DQ250 Mechatronic unit. Some more videos will come soon. This was a defective unit and I have made the video just for documentation. I can also flash new software to existing Mechatronic units or repair them taking your old units in exchange. I can also fix the CIRCUIT BOARD and not only the components in the Mechatronic unit. The Mechatronic units are intercheangeable between car brand and model (no matter what your dealer said), they just need to be re programmed / flashed to fit your car. If you want to move one Mechatronic from one car to another I might be able to help you with the software. IF you need NEW or USED DSG mechatronic units please let me know, I can supply this units at fair prices.